Thank you for taking the time to check out Ring Ninja! At Ring Ninja we sell the highest quality men's wedding rings, at prices that are hard to beat. We also provide you with personal customer service creating a value that cannot be found anywhere else on the internet, or in a brick and mortar jewelry store. All of your emails and phone calls will be returned by myself (Brian, the owner), or a very knowledgeable sales associate. We believe in and stand behind the products we sell here - our line of Tungsten, Cobalt, Titanium, and Stainless Steel wedding rings are made to last. All of our rings come with our 21 day satisfaction guarantee, and our Tungsten, Cobalt, and Titanium rings are eligible for our Lifetime Warranty, which can be used to re-size the ring for as long as your own it. I started Ring Ninja after purchasing my own Tungsten Carbide wedding ring several years ago. I am a former iron worker in Michigan, and while shopping for a wedding ring I was looking for something that could hold up to the stress of the job I do. That's when I came across Tungsten Carbide - I knew this was what I needed. I purchased my ring from a local Zale's Jewelry store for nearly $400! Having worked in an industry that uses a lot of carbide tooling, I began to question the cost of the ring. I used my contacts and located manufacturers - the same manufacturers that made my ring sold at Zale's, and was able to make deals with the manufacturers and bring these rings to you, for a fraction of the cost of retail! Over time we've added Cobalt, Titanium, and Stainless Steel options, and will add more in the future. We are a small business, located in the United States, in Grand Rapids, Michigan. Don't be fooled by other online retailers - these rings are the real deal - they'll ship to you from our location in Grand Rapids, not from some drop shipper, not from someone overseas, but our products are on hand. All of our rings are backed by our 21 day satisfaction guarantee, and our lifetime warrany applies to all Tungsten, Titanium, and Cobalt Chrome rings! If you are looking for a great way to pass on the Ring-Ninja.com savings by giving a gift certificate, click here for amounts you can purchase online. Remember - at Ring Ninja we don't think that Quality should be Expensive! Thanks again for stopping by, and please feel free to check out all of our products! You can Contact us via email at sales@ring-ninja.com. Our phone number is 616-855-7376 - please leave a detailed message if we are unable to answer the phone. After purchase your order will ship the same business day if ordered before 2PM EST. 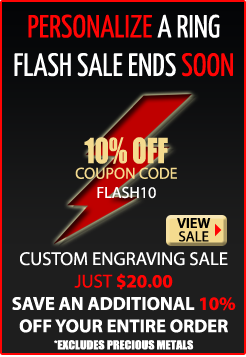 This includes orders that have custom engraving, your engraving will be done as requested and shipped out the same day. For example, if you purchase at 9AM on Thursday, your order will ship on Thursday. If you order on a Friday after 2PM EST, it will ship on Monday. This excludes all postal and major US Holiday's as our shipping department will be closed on these days. We currently offer customers in the USA very affordable (free shipping) via USPS. All orders that are placed on regular business days (this excludes postal holidays and weekends) before 2PM Eastern Standard Time will ship the same day you order, if the product is marked as in stock. Some rings such as fingerprint rings, soundwave rings, and other specialty items may take a few days to make before shipping. If you ever have any questions on this please ask us. Note on Express shipping. It takes 1-2 days for delivery once the item ships. So if you order at 4PM on a Thursday, the item will leave here on a Friday, and Monday should be your arrival date (assuming it isn't a holiday). For our International Customers we ship to every country in the world via either USPS First Class Mail International (Our standard service). This service cost will vary by product weight and takes 2-4 weeks for arrival. We also offer Express Shipping to most countries, and this takes approximately 5 business days to arrive - although this varies depending on your country and customs department. The cost of this service varies by weight. Please understand that while we will ship everything promptly on this end, international delay's can occur, and are in no way the fault of Ring Ninja. This is a very rare occurance, but it can happen. To view all of our terms and conditions including Warranty Information, Exchange Information, and Return Information please click here.